This 31ft custom-built Palm Beach-designed Sport Fisherman powered by twin Volvo engines fishes out of Flamingo (and Carillo, Herradura Bay and Quepos between January and mid-April) is one of the best-known boats in the North Pacific. Captain Junior Bustos is at the helm. She features a fighting chair, forward cabin with head, GPS, depth sounder and VHS radio, and carries a full complement of Shimano, Penn International and Billy Pate rods and reels for conventional and fly fishing. 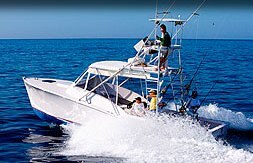 Will also fish out of Carillo, Herradura Bay and Quepos between January and April.